In recent months a few readers have asked for a breakdown of how I built my wardrobe - my plans, my process and my lessons learned. Doing so across all types of garment and even styles would produce a very long, unwieldy piece, so I thought I would focus on one aspect at a time. The first, examined here, is Neapolitan jackets. As time as gone on, I revert more and more to Neapolitan tailors for casual jackets and the occasional casual suit; and stick to English tailors for more business-like and formal suits. It depends on your work environment and lifestyle of course, but I generally need a 50:50 balance of these two styles. In the descriptions below have focused on my cloth and style choices, why I picked them and how they have built into a versatile wardrobe. Choices between tailors is covered in more detail on individual posts. My first experience of Neapolitan tailoring was at Rubinacci, in the (then) new store on Mount Street. I had got to know Luca Rubinacci and was particularly interested in his style, which had applications to the more subtle clothes I wear most days, as well as his louder pieces. I restrained myself from having a bright, silk-scarf lining, which was a Rubinacci trademark, and went for a nice shade of olive-green instead. Definitely the right choice. As with all the pieces listed here, the jacket is pictured above, and the link above goes to more information on it. 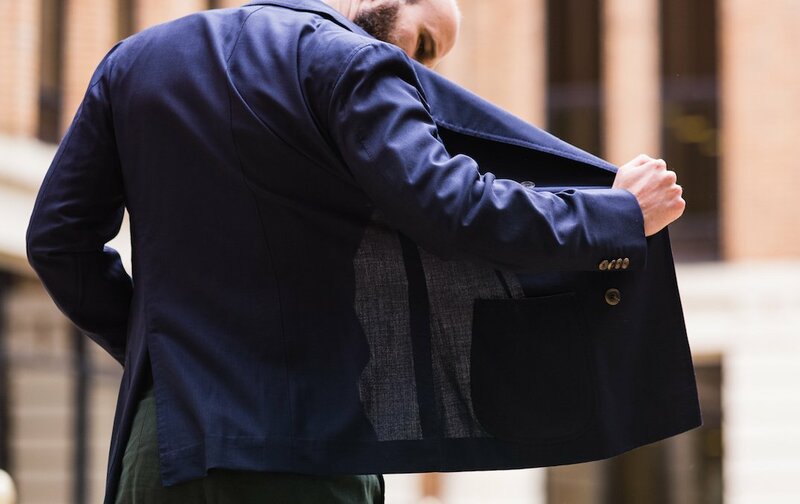 The Rubinacci jacket was perfect for the UK - wearable seven or eight months of the year - but Neapolitan jackets are particularly helpful in the summer, so I was keen to try something lightweight next time. 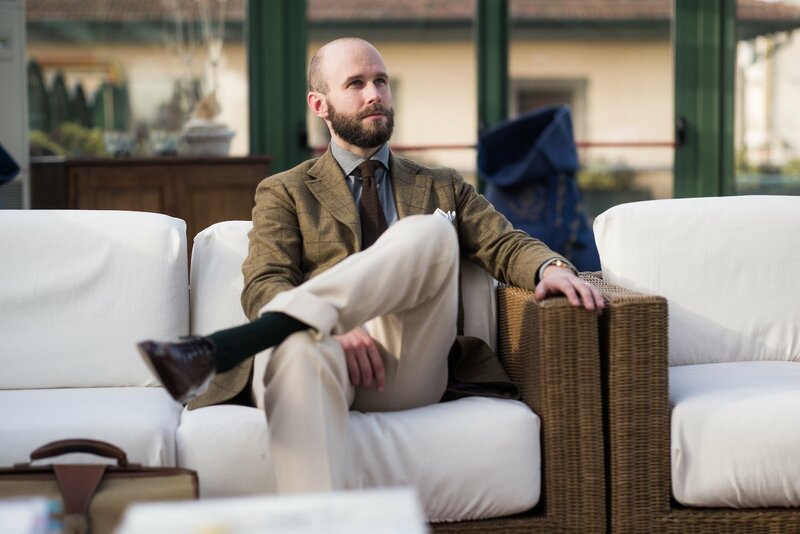 When I began working with Elia Caliendo, therefore, I selected a Loro Piana summer fabric that was a silk/linen/wool mix, in a pale straw colour. I’ve never seen such a great colour in a summer fabric since, and I even have fears of somehow damaging the jacket and not being able to get hold of anything similar again. Most light summer colours are too pale or too strong to be versatile, but this muted yellow with brown in the weave was spot on, with the herringbone providing a touch of surface interest. When we created a Permanent Style tweed with Breanish in 2012, I really only had Elia in mind to make it. The rough nature of the material was perfect for denim, and it therefore needed a Neapolitan make. 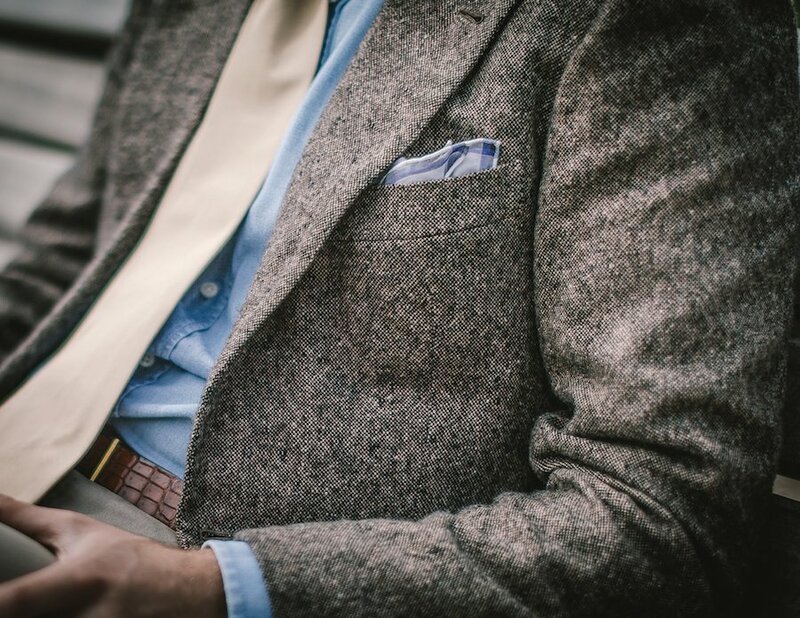 It also felt like a nice combination with the summer jacket and the cashmere Rubinacci. All three fitted into distinct pockets, with the tweed being by far the most casual of the three, more likely to be worn at the weekend. So far, my choices seem to have been pretty deliberate and effective. I can take no credit at all, however, for this selection. I originally wanted a grey glen-check cloth with blue and brown overchecks. I had seen a Sartorialist photo including something similar and wanted to replicate the look. When I visited Solito in Naples, it turned out the grey glen-check was sold out. So I went with the same pattern in a different colour - this green with black and orange. It was an interesting combination and both dark and subtle enough to not be too risky. It turned out to be one of my best decisions. Something unusual yet highly versatile is hard to find, but this hit the spot perfectly. 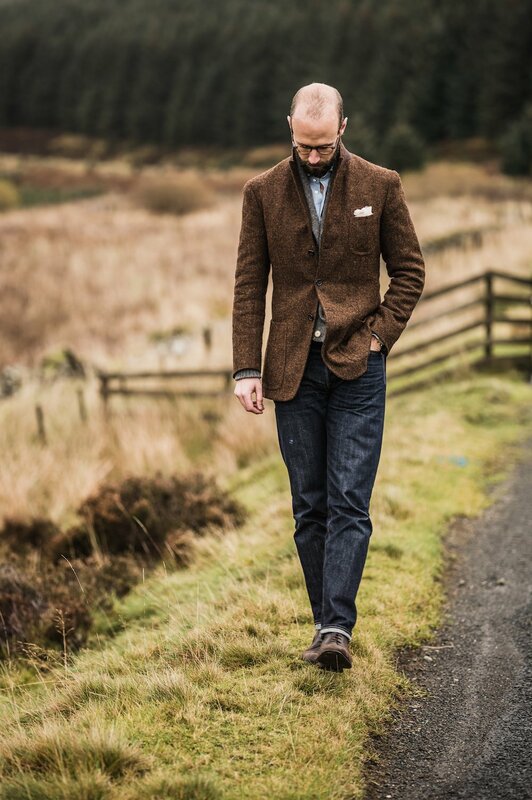 This brown tweed might be my favourite jacket of all. But again I can take no credit for it. Elia, having seen how pleased I was with the Permanent Style tweed jacket, showed me this archive tweed when he met me in London on one trip. It may seem, by the way, that there have been precious few mistakes on this journey through Neapolitan tailoring. And that would be correct: coincidentally, there have been far fewer here than in English tailoring. But it’s also worth noting that I started down this road a year after having my first bespoke suit - at Graham Browne. I had learned the lessons of having too-unusual styles (DBs) or colours (camel-hair overcoats). If this five-strong collection of Neapolitan jackets lacked something (and God knows I’m always looking) it was a more formal jacket. Not to replace the English suits, but as a more relaxed option around the office. If I have any kind of uniform, it is such soft-structured or drapey jackets (so they can be worn at a desk all day), an open-necked blue shirt, flannel trousers and brown shoes. A Neapolitan but smarter option here would be good. A navy-cashmere is as useful as it gets in that regard, and it has proved to be the heaviest-worn of all of the jackets listed here. Perhaps even of all the jackets I own. When you like wearing polo shirts, grey shirts or denim shirts under a jacket, something simple and versatile like navy cashmere comes out a lot. The navy cashmere was such a success, in fact, that my next commission was a summer version, in hopsack. In one way it could be seen as my first mistake, however. I had never had a double-breasted jacket from a Neapolitan maker before, and couldn’t resist trying it. Much as I like Elia’s DB style, and have worn the jacket regularly, a single-breasted version would have been even more useful and would have been worn more. Three stages led up to this commission. First, meeting the guys from Escorial and loving the softness and natural stretch of the wool. Second, seeing that Ralph Lauren carried it for jacketings and had a great muted green with very subtle purple overcheck. And third, asking Escorial if they could get me any (which they could, and which others can now too). I had made mistakes with windowpane checks before. I have a lovely Thom Sweeney jacket, for instance, which is navy with light-blue windowpane, but find it surprisingly bold. Everything else has to be toned down, to go with a piece that was meant to be quite versatile. This Escorial has had no such issues. The check is so subtle (dark as well as faint) that it is just as useful as a plain green. Although the navy cashmere jacket was extremely useful, I wasn’t that impressed with the lightweight Zegna cloth, which started to wear and fade at the elbows and collar rather quickly. For a Neapolitan jacket the following year, therefore, I picked a Loro Piana cashmere, and that has performed much better. It is slightly heavier, admittedly, but even accounting for that it has held up better. As discussed in the post on the jacket itself, I also found the colour very interesting. Having built up a collection of blues, greys, browns and greens, it was good to find something that was sufficiently different to the rest and had a genuinely new appeal: not a classic navy or grey, but plain and muted enough to suit most business environments. This was a plain copy. I don’t think anyone should be embarrassed about copying their peers. So many senior people in the industry admit to doing so. No matter how many things you’ve seen, someone will see something you haven’t. I saw Yasuto Camoshita wearing a dark-brown summer suit, with a white shirt and dark-grey tie, and loved the look. This Crispaire suit from Dalcuore achieved the look very well, though (as again often happens) I found it difficult to wear in many situations. Nice with those monotone accessories and black shoes, difficult with much else. Looking at the last three commissions on this list, it occurs to me that I am increasingly moving towards different tones of brown in my tailoring. It honestly hadn’t occurred to me before, but along with a caramel-brown jacket and brown cord suit in the works, there is a serious trend here. Huh. I had loved cotton for a long time, but made the mistake years ago of having one made by Choppin & Lodge in a structured, English cut. The suit was great, but the material was much better suited to a Neapolitan make. That remained at the back of my mind for five years and was finally realised with Elia last summer. I had considered a navy cotton, as the Choppin one had been, but as the suit was specifically made for the Young Tailors Symposium in the summer, navy seemed a bit too boring. So light brown it was. I had hoped that the jacket would soften up enough to be worn casually with denim and so on. It hasn’t done so so far, but I know its first dry clean will take some of the stiffness out (as happens with linen) so we’ll see. For anyone that is interested in more detail on these commissions, please click on the links under each one. You can follow the discussion on Building a wardrobe: Neapolitan tailoring by entering your email address in the box below. You will then receive an email every time a new comment is added. These will also contain a link to a page where you can stop the alerts, and remove all of your related data from the site. Fantastic article Simon. A real strength of your site is the depth and breadth of commissions so it’s really helpful to see a piece where you reflect on them. Great article, I love neapolitan tailoring. A question. I work in ‘chinos and jacket’ office and usually wear neapolitican jackets but also suits. I think that it is easier to dress down with a neapolitan suit even if it is a navy worsted. Do you think it is too informal to wear a navy or charcoal worsted neapolitan suit in some business environments? Excellent article Simon, thanks. I’m really looking forward to reading through this one in greater detail. On a slightly-but-not-really-related note, I’m currently looking to add some cream-coloured flannel trousers to my wardrobe and would appreciate some advice on the best places to find them. My budget isn’t going to stretch to bespoke unfortunately, so it’s going to have to be high-quality RTW. Any suggestions from you or other PS readers would be greatly appreciated. It’ll be patchy whether you can find them anywhere high street like Hackett or Ralph Lauren. I’d recommend going to Anderson & Sheppard. More expensive, but you can pick from a big range of materials and have them fitted. Perfect, thanks Simon. I’ll check out A&S with Hackett as a fall back option. Dan, I also struggled to find on the high street. Suitsupply however do have some VBC off-white flannels at the moment which are decent quality for the price. In the flesh I found them to be a bit too much on the yellow side of cream for my taste but they’re worth a look – especially considering their generous returns policy. Thanks Sam – I’ll take a look. Appreciate you taking the time to reply. Great article, thank you Simon. Really interesting to see the different pieces you have commissioned of this type. On your comment in the first section about using Neapolitan tailors for casual jackets and English tailors for business suits; do you think that the English soft / drape (S. Hitchcock, A&S) style is also suitable for casual jackets? How would such jackets compare to the Neapolitans? You might have to wait a few weeks before the majority of RTW shops begin stocking for spring and summer. New & Lingwood in London had some nice cream Fox Bros. flannels in stock last year. Cheaper than A&S and better quality than Hackett and RL. This is an excellent article Simon. Caliendo and Solito do some fantastic work obviously both having a superb taste level. I was a bit surprised concerning your comment on the durability of the Zegna cashmere however, as it’s supposed to be among the best. To what do you attribute this fabrics poor performance? Love articles such as these – to contrast and compare cut, cloth and colour is always informative – thank you. 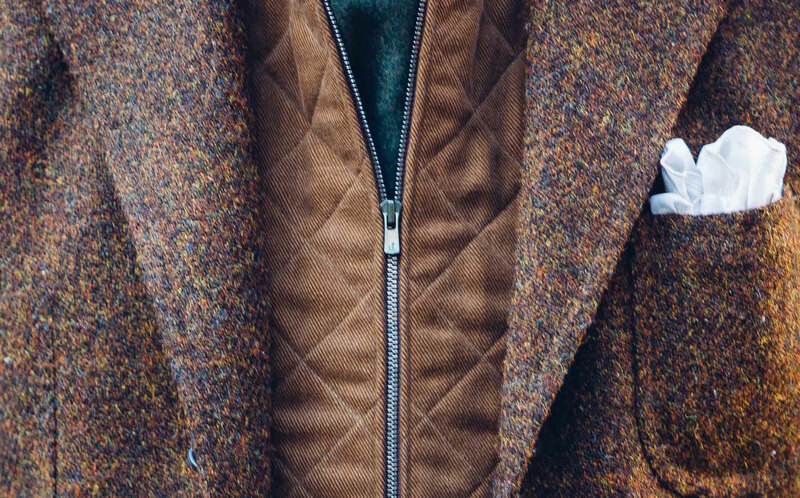 A beautiful pocket hank features with your Caliendo Summer jacket, could you please give some detail (I did check original article but could not find)? I love hopsack and thought your Caliendo DB a nice addition – have you tried it with a good fitting t-shirt (white, grey, navy, black) and jeans/cream chinos – I think it might have a different dynamic with a more casual style. Lastly, Happy New Year Simon and thank you for all the great articles in 2016! For me Coliendo has it hands down and I am seriously tempted to give this house a go. 1) I don’t like the patch breast pockets. 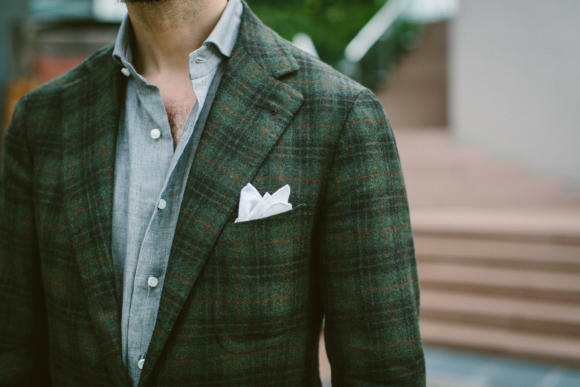 Albeit perhaps the presence of a pocket square is accentuating it too much and I may think differently if I were to see them without. 2) I’m not a fan of the one button cuff. I note you changed that on more recent projects. Personally I don’t like the Rubinacci at all. I just don’t like the cut and I think the side pockets are awfull. All in all an excellent summary piece that allows a true comparison and with the perspective of wearing the garments over time. I’ve definitely decided to commission 1 summer and 1 winter piece from Coliendo. Elia is flexible about the two things you mentioned. In fact on a family formal SB he made me, he suggested a welted breast pocket (barchetta style) and a 4 button cuff. NB his surname is ‘Caliendo’. Hi Simon, would you have a list of Neapolitan tailors that you’ve used based in London? 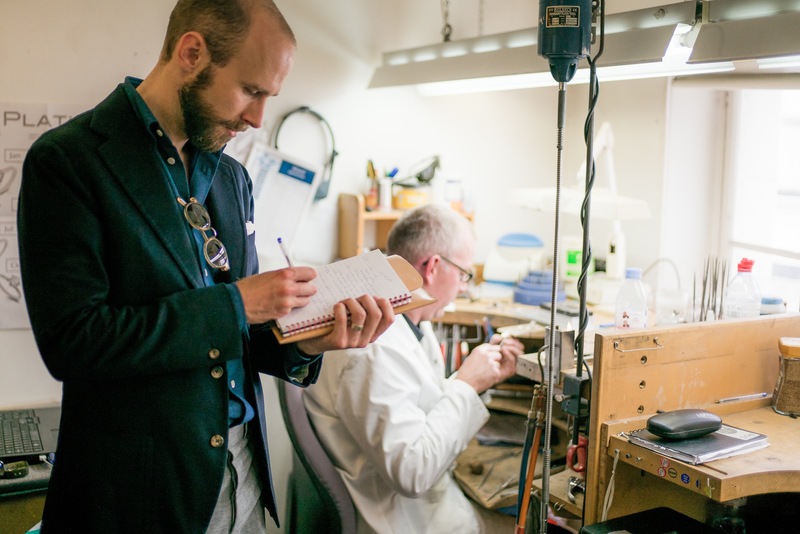 For someone based in London looking to dip a toe into the world of Neapolitan tailoring, it would seem Rubunacci is the only option (aside from trunk show visits) but looking at their website is somewhat confusing. They mention bespoke but all the blazers shown are offered with RTW sizing. At the price point, I’d have assumed bespoke but again, it’s difficult to tell what they’re offering. They offer bespoke and RTW – those prices are not bespoke…. Very nice article. Looking forward for the following articles from this series. The real question from me is if you had to start again with a slightly more limited budget, and looking back on how much wear you get out of them which 2 would you pick to be made first? Obviously life style is everything when it comes to ‘most used’. Had I chosen this array my most used would have undoubtably be the Harris tweed and the hopsack. That said your point about commissioning the hopsack as a SB rather than a DB is key and I couldn’t agree more. Summer jackets in DB are a bit of a contradiction to me. I have a beautiful summer DB in a zegna cloth that I seldom wear simply because I don’t want to feel ‘trussed’ in warm weather. I also think that traveling with a DB is more difficult. They are inevitably so distinctive that they limit the versatility of your traveling wardrobe. Thank you for a well-written and informative article, Simon. It’s very interesting to see how you’ve built your wardrobe. Nice garments! What made you opt for the Loro Piana cashmere? It’s beautiful but I find the price tag hard to justify when other (slightly cheaper options) exist such as Piacenza. Even Holland & Sherry is slightly less expensive AFAIK. Nice post Simon. My personal favorites are the Caliendo summer jacket and the Solito navy cashmere. They all feel very versatile. Is it possible the style you went with was part of the issue? As I recall it was quite a heavy structured DB. Perhaps something more casual / less structured would have made it more versitile as a more casual piece? Escorial, “… which others can now too”: apparently not. I have tried to email Kristie Reeves multiple times, with no reply. Do you have alternative contact information? Cheers. Thanks for the suggestion, but that particular fabric doesn’t seem to be available there. Thank you for that Simon. Having been an avid follower of yours for quite awhile, I feel as though I accompanied you on each of these journeys. This, nevertheless, is a refreshing summary – with an opportunity to follow the link and get a more in depth view if wanted. Do you think one day you could have a “lookbook” of sorts on your site, that is, a place where one can just see ALL the photos from Permanent Style through the years without any verbiage? I would enjoy such a “picture only” section for one and would probably visit it multiple times a week. I am curious to know how your other followers would respond to such a thing….taking into account of course the slight intellectual embarrassment a person may feel asking for a picture only book or admitting that such a thing would be enjoyed. Simon, may I ask what you are wearing under the Caliendo brown Harris tweed? What’s the difference between a 2 button jacket and a 3 roll 2. The latter simply looks like a 2 button with a redundant top button. The the two approaches result in a different lapel roll? I assume they both finish at the same point. Good article but doesn’t really explain why one would go with a 3 roll 2 as oppose to a standard 2 button. Does the lapel roll differently across the two styles? Does the unused top button cause the lapel to flare out more? Does the roll finish at the middle button? Or above it? The quarters on your Neapolitan jackets look quite closed. Are the pictures reflective of how they look in the flesh? I had thought that Neapolitan jackets traditionally were quite open. You’ve covered lapels in a previous article. Perhaps a future article could cover the effects of open and closed quarters. I always wondered, is the effect of open quarters in Neopolitan jackets to balance out the larger lapels, to wit, vertical balance? I believe the original reason for open quarters was to accommodate horse riding. This was a helpful article to bring it all together. Of all the Neapolitan tailors mentioned here, I’ve discovered that only Rubinacci travels to my town. I get the feeling Rubinacci is perhaps not Simon’s number one fit these days, but if they are my only outlet for Neapolitan bespoke, should I still expect much joy with the results? I’m too far from New York to have the kind of choice on offer. Are the Escorial and green Solito jackets used in the winter months only? What is the weight of the green solito jacket? I will be in Naples this year. Regarding a bespoke jacket, would you need to make an appointment with Caliendo or is a walk-in acceptable? Do you perceive any great advantages/disadvantages vis-à-vis Naples shop vs London visit? I have a now have a nice collection of bespoke neapolitan jackets for all seasons except summer. I wanted to commission a nice cotton jacket with three patch pockets like the Caliendo one above. What would be the most versatile colour? I would like to wear it with Denim and casual trousers. I now have a few bespoke neapolitan jackets covering all seasons except the height of summer. I wanted to commission a cotton jacket like the one from the Caliendo suit above. Which colour would be most versatile and which would be best with denim? Wouldn’t the Caliendo cotton suit be a classic ‘three way’ piece, with trouser and jacket easy to wear as separates? 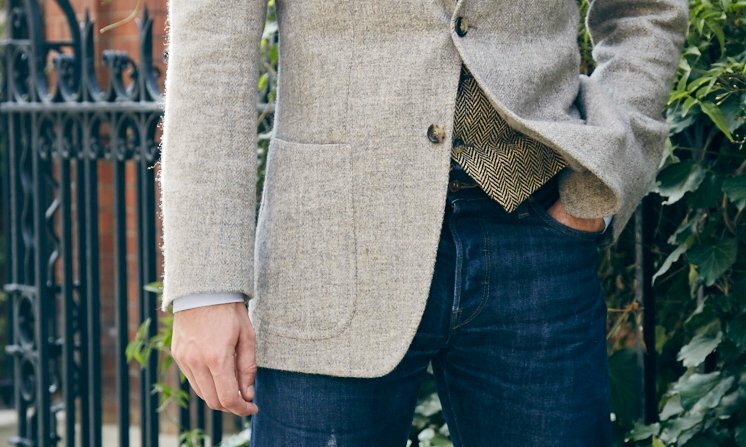 Would a Linen Neapolitan jacket be good with denim? What colour would go best with denim? It would be ok, but the Italian linen/wool/silk mixes would likely be better. Linen could still be a little stiff, though helped by being lightweight and softened after dry cleaning. Would you consider a jacket like the Caliendo brown Harris tweet with a peak lapel? Or would that be too formal? I’d avoid it. It would be a little formal and also a little showy. Which doesn’t really suit such a casual cloth. I’m considering commissioning a Neapolitan-style sport jacket from either B&Tailor or Solito that will be sufficiently casual to wear with jeans. I would like it to be as adaptable as possible, so I’m thinking navy. I would also like it to be as close to a “four season” garment as possible (I live in New York City). Any recommendations on cloth? Also, what was the cloth Solito was sold out of that you ended up going with the green (if you remember)? Thanks! I think you’ll struggle to have something navy that would work with jeans I’m afraid. It would be very versatile for smarter outfits, however. You will also struggle to have something that is really four season in NYC, with its extremes of weather. I would suggest just going for a light, 8/9 ounce jacket, and expect to put a heavier coat over it in winter. If you mean my dark-green Solito jacket (not the escorial one) it was this weight, and from Cacciopoli, in wool. It is no longer available, however. Thanks Simon. What weight was the escorial jacket? And does Solito carry that fabric or did you have to order it separately? I am a researcher based in Amsterdam and as part of my PhD research I am looking for respondents having 10 or more personalised garments in their wardrobe. With “personalised garment” I mean clothes that have been made upon request with participation of the wearer in the process, for example made-to-measure clothes, self-made clothes, clothes made by family members or friends upon request, customised clothes, etc. This excludes ready-made clothes adjusted after purchase. I would appreciate your help to find men having made-to-measure, bespoke suits and/or other personalised garments in their wardrobe. Each piece of a suit counts as a separate garment. Respondents need to live in the Netherlands to be suitable for this study, though, as I need to analyse the wardrobe itself. The findings will be anonymous. Any help to be able to continue with my research is very welcome, as companies are naturally hesitant to share information about their clients. 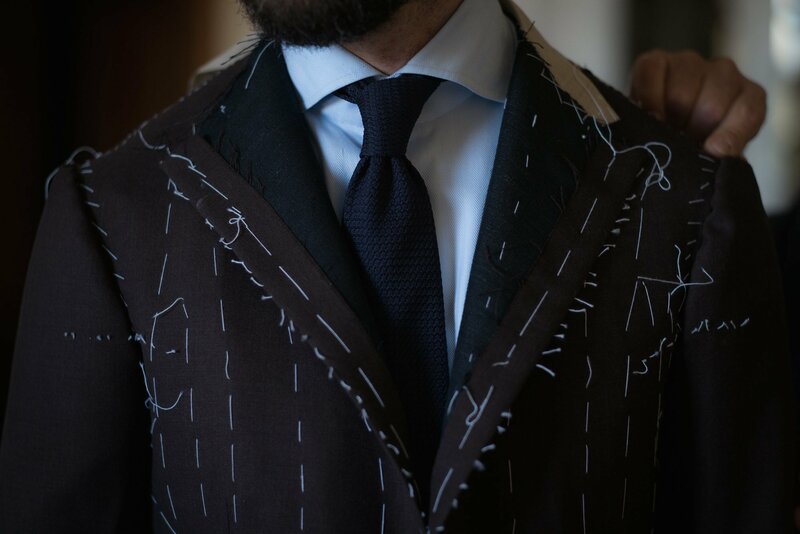 I have an unusuall question: I know Neapolitan tailors use silk thread for button holes but do they use it for all the stitching throughout the jacket as well? I’ve become alergic to silk and I was told that cotton thread is used for everything except button holes. Personally I’d go for another plain blue on the shirt, but maybe in a different material, like a twill or a chambray. More versatile. On the trousers, I’d add another grey in there, maybe mid-grey in a different weight/texture. Or a dark green. I’m planning a trip to Naples to have a jacket made. Do the tailors tend to have better jacketing bunches than are available in the UK? Also, any suggestions on where I can get fabric whilst over there? Can I ask how much shorter Neapolitan jackets are compared to English jackets? I believe, in the past, you’ve said that jackets should always cover the entire seat. Is this true of Neapolitan jackets? Generally yes, though there is some decent variation there. Dalcuore often longer than Solito, for example. Thanks for the response. I’m still at fitting stage. The jacket doesn’t completely cover my seat. It’s a little above my knuckles, say 1.5cm. Would you say this is acceptable? When looking in the mirror, it seems to look ok but this , I think, can be subjective depending on trouser rise. Thoughts? I would appreciate your advice on ordering my first bespoke suit. I can’t justify English or French due to price, so I would opt for Neapolitan (I understand they are more affordable), and I also happen to like the more ‘deconstructed’ suits. So what I’m looking for is a classic single-breasted business suit in navy, 3-roll-2, traditional jacket length (not short), wider lapels, maybe working buttons. I would also need a tailor traveling to Western European capitals as I can’t go to Naples myself. And my price range would be in the neighbourhood of 2,000 euro, not too far up. Is this even possible and if so whom would you recommend? I like the style of Sartoria Formosa and Eidos suits, and also Sciamat, and your Dalcuore suit. Much obliged. I see. I guess I should save up a bit more for a while and go for that. So I should look at Dalcuore probably? Any other suggestions? I would try Saman Amel. Top-notch MTM. They are based in Stockholm but visits London every 2 month. Thanks Carl – as mentioned, I am trying them. I’m told it’s every three months though. They are back in October. Dear Simon, and how about Biagio Granata? I’m reading some very nice things about them online (e.g. Dirnelli is a fan), and I see some comments here as well commending them. Any thoughts? Fantastic. Much appreciated. Will check out the Instagram story as well. Stories are only on Instagram for 24 hours (I know, silly system) so you won’t be able to view it there now. Ah, right, just like on Snapchat, which originally introduced stories. He may be having a trunk show in NYC in October btw. (I encouraged him to come). Thank you for the insightful article. Two years ago I started building my wardrobe based on pieces you’ve had commissioned. More than a dozen sport jackets later there is some feeling of accomplishment. For the Solito navy cashmere blazer, I decided on a Lori Piana navy wool cashmere blend. The cloth is mostly wool in a nice twill from their dream tweed bunch. It’s by far my most frequently worn piece in cooler to cold weather. The LP cloth is durable from my experience. Courtney, could you please comment further on your experience with Solito? I am considering commissioning a jacket with him. I like the style but have heard some concerning comments regarding responsiveness and fit quality. Simon, perhaps you can also comment on recent experiences or feedback from other readers. I live in NY and will have to have fittings every three months or so. I am commissioning a navy sport coat from Saman Amel (Napoli line). I will use a 320 g version of Loro Pianas Cashmere Wish. Would you recommend having it lined or half lined? I usually prefer half lining but is thinking that it will fall better on my back with a full lining. What do you think? It will be with a soft canvas and spalla camicia. It will get caught occasionally, and not sit quite as cleanly. But it’s a nice detail. Up to you on weighing up those two points. I already have a navy hopsack jacket from Elia for the warmer months but I’m struggling to get a light wool fabric for the summer that can be worn with jeans and chinos. I’m looking at Drapers hopsack in brown. Do you think this colour would be appropriate and if so should it be on the darker or lighter side? I spoke with a sales agent today from a Florida menswear shop called Artigiano asking about their bespoke offerings. He told me that they do “full bespoke” (pattern, hand padded collar, fully canvassed, etc.) for $1375 with entry level 120s New Zealand merino. I was told that all the work is done in Santiago (in the Dominican Republic). This is a shop that used to sell d’Avenza (it was selling level 5 and 6 suits). Does this make logical sense – in terms of price? The store has really good reviews (on Yelp), but that is hardly proof-positive (of anything). I wonder about the competence of tailors in Santiago (I haven’t heard anything about them one way or another), but I was assured that I’d be getting a garment that is on par, or better, than d’Avenza. “Better,” he said, because there would be a good deal of hand-work. Can you speak to this question generally and/or specifically? Any suggestions about how to research something like this? It’s really hard to say Wes. Ignore comparisons with Avenza, given that’s not bespoke, and try to look in detail at the finished garment – affirm it’s hand padded by looking for prick marks under the lapel. And look generally for the quality of finishing and fit. Re the Rubinacci jacket: I am struggling to find donegal cashmere cloths. Any mills in mind you can share. Simon, were your Solito jackets cut by the father or the son? I am asking because I read somewhere that it makes a difference. It’s varied – the original pattern was done by Gennaro years ago, but most recent ones have been done by Luigi. Hard to separate at this point. I would just make sure Luigi understands all your preferences when it comes to fit (length, tightness etc) when you meet him. Most other differences will be very small. – SS: seersucker suit and off white linen trousers. Then another sport coat in W/S/L. – FW: blue blazer in Fox Bros. Somerset or in Shetland tweed (I love tweed! ), off white cotton trousers and Cav. Twill cream/beige trousers. Then PoW flannel 3p suit or charcoal 4-ply 3p suit. What do you think about this plan? Is it worth considering something else? This sounds good, yes, and like you are on the right lines. – And on F/W perhaps one of the suits first, or a nice coat? You have lots of tweed! Well, I will need a SS suit to attend a wedding. Given it will be not too formal, in the morning and want to avoid wearing the linen suit, I thought about seersucker. But I will check if there is some cotton i would like… Fawn colored maybe. For the model I’m thinking about Polo Coat (classic color) or a raglan coat. While traditional (white and light blue stripes) seersucker may be a little on the dandy side of things, it does come in, for example, navy and various shades of blue and is a great choice for a more conservative summer suit. True words about the seersucker. Indeed I will pick one of the “newest” color combo. 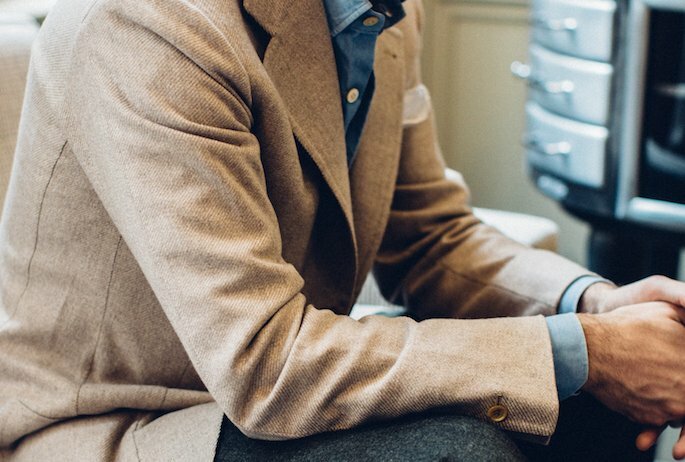 About the winter blazer i’m considering Fox Brothers Somerset Jacketing FJ350-B2692/45. Can you advice other fabrics? I’m going to make a brass/ancient silver buttons blazer with 3-roll-2 configuration, rollino, 2 patch pockets and barchetta breast pockets. I’m planning on making my first bespoke commission. For a long time I have been a fan of Neapolitan tailoring and it’s style – and I need a bit of guidance. Which tailor should I pick? 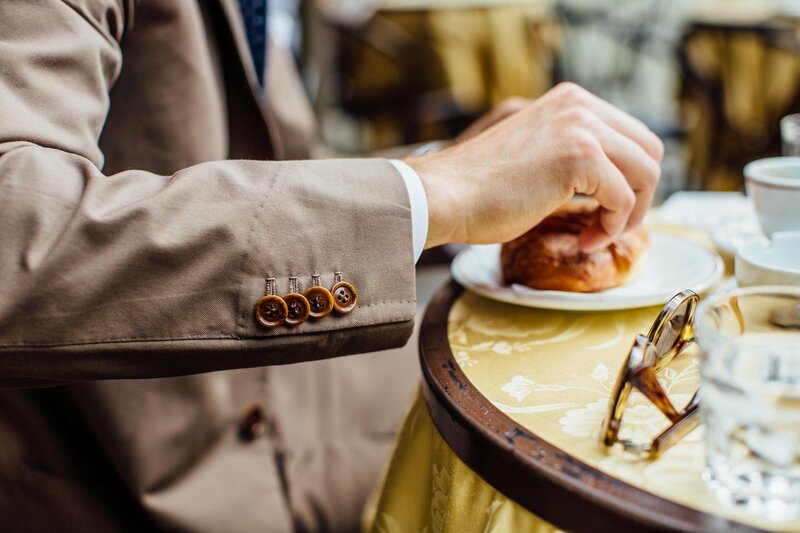 What I’m opting for is a classical Neapolitan suit, with a shirt-style sleeve (spalla camicia), their soft construction, finishing at the top end for a Neapolitan and perhaps a jacket that’s a tad longer than some of the Neapolitans. I’m leaning towards Caliendo – but I do have one concern. I’ve never seen any of his tailoring in person, but in quite a lot of the pictures I’ve seen I think it looks like his jackets have some drape in the chest and more excessive fabric there than other Neapolitans. Is this correct? I prefer having a jacket with little/no drape. I hope you are well. I noticed that most of your jackets from Elia and your summer checked jacket for the Dalcuore Rakishman day had the traditional spalla camicia shoulder construction with the fullness fed more into the bottom of the sleevehead, instead of the top, avoiding the prominent pleating on the top that is the current rage. The shoulder style very closely resembles a slightly extended soft shoulder and seems to me, the epitome of understated style. It’s something that could go unnoticed, yet gently draw people’s eyes to them and make them wonder what makes the jacket you are wearing feel so soft and elegant. I am meeting Patrick, the head cutter of WW Chan, this March in San Francisco for a trunk show and I plan on showing him pictures of your Caliendo shoulders and the summer checked jacket shoulders. If you look at their instagram, you will find many 3-2 roll Neapolitan style jackets and many soft shoulder jackets – I think they can definitely create something close. Could you provide a more detailed and technical explanation of the aforementioned “traditional” Neapolitan shoulder? I am sure many readers would find such information highly valuable, and you could easily transplant your response into a future post! I wouldn’t say the difference is that the fullness is more at the bottom than the top. And that could be misleading when described. I would just say that you don’t want quite as much fullness at the top of the shoulder – a little less there means a little less rippling. I think that’s all the technical description you should need. I would also say, however, that you should never expect a tailor to be able to or want to exactly copy what someone else has done. It’s rather insulting in a way. And more importantly, it’s just never going to be exactly the same. If you want Elia or Dalcuore, get that. If you like WW Chan’s soft or Neapolitan-style jackets, then go with that. Thank you for the explanation and advice. Looking forward to my first bespoke jacket! What are your thoughts on a lapped shoulder seam for soft shoulder SCs? Hmm, I read your article on lapped seams and all the picture examples have expired. If you take a quick peak at KayJen Dylan on instagram, a lot of their shoulders for jackets look exactly like a dress shirt with a very noticeable seam on the top of the sleevehead. Are those an example of a spalla camicia with lapped seams? I don’t like it when the pleating/shirring is higher than the shoulder – it is too flashy for my taste. Thank you for the explanation – I can now see that you can emphasize the lapped seam via a swelled edge effect or have it barely noticeable. I am thinking about commissioning a summer suit with our mutual friend Saman Amel. I am thinking about a brown suit in Irish linen. But I know that you have made your linen suit in London and wonder if you think a Neapolitan style would be to casual. Hello, can you suggest any tailors in London that can alter jackets with Neapolitan shoulders? The sleeves need shortening and I don’t think I can trust most tailors to leave the same wrinkled finish at the shoulders! You’re always going to be safest taking it back to the same tailor – even if the English tailor (and I’d recommend Graham Browne) is familiar with Neapolitan work. Or, if it’s a small change, doing it from the end of the sleeve. Curious about the fate of your wonderful navy Solito jacket. Did you end up having to add elbow patches? Do you still wear it? This jacket was the inspiration for my first bespoke commission. After reading your comments on the quality of the Zegna fabric I went for a heavy cashmere instead and could not be happier. Congratulations on a successful year for Permanent Style.